2. Mix together Italian dressing mix and water. Pour over chicken. 3. Cover and cook on high for 4 hours OR low for 8 hours. 4. Mix together cream cheese and soup in separate bowl. 5. 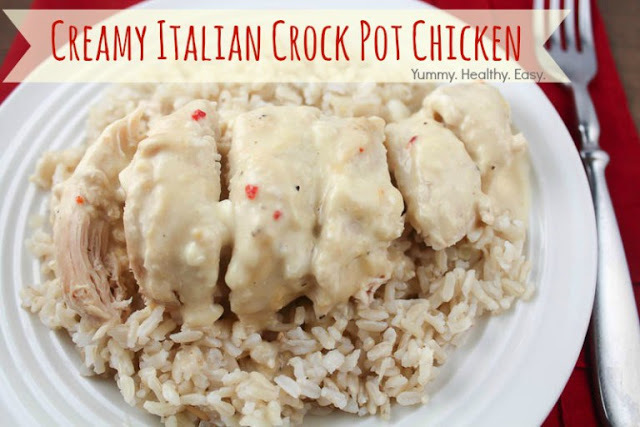 Carefully remove chicken from crock pot to plate. 6. Pour cream cheese/soup mixture into crock pot and mix together with dressing in bottom. 7. Return chicken to crock pot and mix gently to shred the chicken. 8. Cook on LOW until heated through. Makes 6 servings. Approximately 2/3 cup mixture with 1/2 cup rice. This recipe can be made with FAT FREE cream cheese and it saves about 6 grams of fat. However, I feel that the dish benefits from the flavor of the low fat over the fat free.